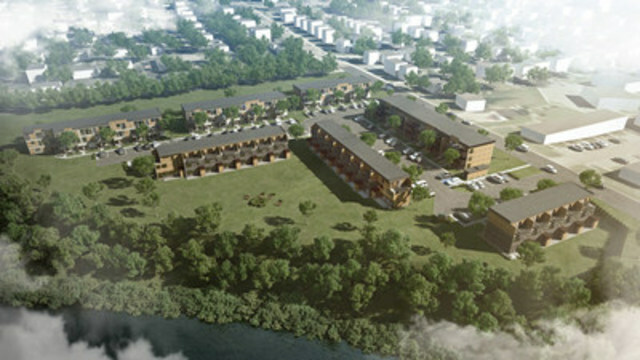 QUÉBEC CITY, Oct. 3, 2016 /CNW Telbec/ - Fonds immobilier de solidarité FTQ and Groupe immobilier SMB are partnering on Le Hameau Saint-Jacques, a new residential development that capitalizes on the natural setting of the Les Rivières borough and located on Saint-Jacques Boulevard, at the northwest tip of the Lebourgneuf neighbourhood in Québec City. The first building, consisting of 15 condominium units, is part of a larger residential development that once completed will comprise 7 contemporary-design buildings, including 40 two- and three-storey townhomes, just minutes from the Galeries de la Capitale and the Mesnil business district. Strategically located on the banks of the Saint-Charles River and next to Chauveau Park, Le Hameau Saint-Jacques will appeal to nature lovers, who will find direct access to both cycling and hiking paths. The first building will break ground in days ahead. Spread over three floors above ground, the 15 condo units, measuring 1,350 ft2 each, come with two outdoor parking spaces and a balcony. Le Hameau Saint-Jacques offers buyers a choice of customized finishes. "This new project is in an unbeatable location, near major roadways, including Autoroute Félix-Leclerc, and in the centre of the neighbourhood's commercial hub," said Sylvain Tremblay, president of Groupe immobilier SMB. "We were looking for a rallying project that combines the pleasures of country living with the appeal of city life. We succeeded in doing this with Le Hameau Saint-Jacques." "Our new partner has extensive experience in this type of residential construction and has found a site with tremendous appeal," added Normand Bélanger, President and Chief Executive Officer of Fonds immobilier de solidarité FTQ. "This project will add value to our real estate portfolio, which is already expanding rapidly in the Greater Québec City Area as well as helping to create jobs."